This discussion was prompted by Panos when he mentioned not being familiar with OneNote in another topic. 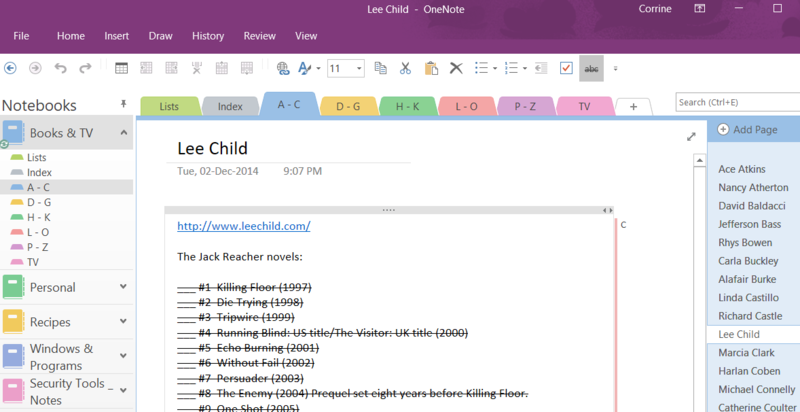 Since it is one of my favorite apps, I jumped the gun to start sharing information about OneNote. As can be seen in the image, I have favorite authors indexed and listed alphabetically in OneNote. Each author page includes a link to their website and a list of their books. Since I read three or four books a week, this is how I keep track of which books I've read and the books next on the list to borrow from the library. The list also came in handy when plodr and I were discussing authors not long ago. I went through my list and gave her links to a number of favorite authors and she gave me names that I added to a list to check the library online catalog. In the "Recipe" notebook, I have a "Grocery List". It is broken down by category (produce, dairy, baking, etc.) and has check boxes (To do). When I'm running low on something, I place a check next to the item. Then, the next trip to the grocery store, I pull up the list and uncheck each item as I add it to the grocery cart. No more forgetting to pick up some needed item. 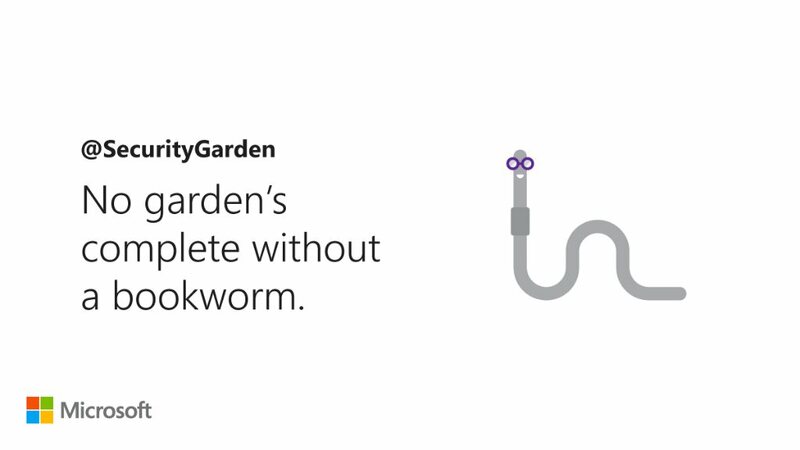 One last thing for this starter topic: In the Twitter conversation I mentioned above, the conversation went back & forth for a bit and, coincidentally, whoever does the Microsoft OneNote Twitter account created and posted the cutest (ok, to me it was cute) image yesterday. Please share tricks, tips and how you use OneNote or ask questions about features. Very detailed presentation, Corrine! Thank you! Can we say that OneNote is an electronic agenda? I have to try it too! I have OneNote as a part of Office 2016. I started using it and I got the impression that it is a kind of a digital diary. On our phones we have Notes and Remember to Do list, and I think that it is something similar, but having a lot of other features. I like it. I have to organize my life, so I can use it!!! 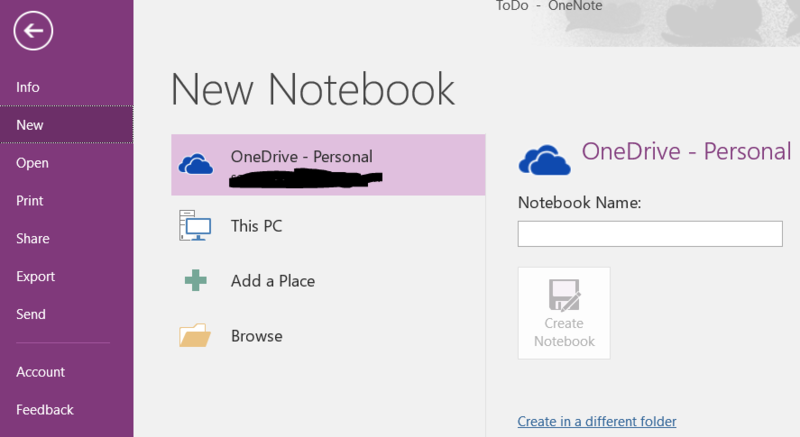 OneNote is great, especially with it set up to OneDrive so you can access the information from anywhere! As to using OneNote as an electronic agenda, you could but there is also Microsoft To-Do. What do you mean, Corrine? Having OneDrive also offers the access from anywhere. What do you mean by saying ''with it set up to OneDrive''? With OneNote, there is no “Save” option, as what you do is automatically saved in real time. And, if you store your OneNote file on OneDrive, you can open the OneNote file on your PC, your tablet, and your phone, always accessing the latest version. Plus, when you make changes on, say, your phone, they’ll show up everywhere else. Thank you both, Corrine and Aaron! One last question for today: Do I have to save a Notebook to OneDrive to have access to it from everywhere? Having the OneNote installed on computer and phone doesn't gives this sync opportunity too? With OneNote saved to your PC, unless you have remote access to your PC from your phone, the sync settings are saved to your OneDrive account anyway. See About sync settings on Windows 10 devices. Although it isn't quite kosher, it isn't "against the rules". If you are short of space on OneDrive, you could create another account which would give you 5GB storage. You can then share that account with your primary account. Do I have to save a Notebook to OneDrive to have access to it from everywhere? Yes. Your phone won't reach out directly to your PC for it. I want to say the free space you get on OneDrive is 5 GB. Right now my OneNote file is about 45 MB, so about 1% of that space. Curious @Corrine what your file size is, so DR M can get a feel of how much cloud space this eats, at least from our usage. I had to go to the OneDrive website to get the size; didn't see it in OneNote itself or in my local OneDrive sync folder. I'm using 67.98 MB for eight Notebooks, each with numerous sections & pages. Thanks again for the information. I inserted three photos in the Notebook (I wanted some info from them), so I saw the OneNote file in OneDrive reaching 20mb of space at once. That's why I pointed out the space issue. If you think about it, Panos, 20 MB is .02 GB. Rounded off, the three pictures were ~6.7 MB each which is actually .0067 GB. So, you'd need to add ~746 photos to a Notebook to use your allotted 5 GB. That said, although photos can certainly be shared to OneNote and certainly can supplement other information in OneNote, that really isn't the intended purpose. Sure, Corrine. Saving photos is not the intended purpose of OneNote. I started using it and I like it. Thanks for letting me know about this useful application. Tips & How To's by Microsoft MVP Kelly Marshall: OneNote Archives - Oh! 365, Eh? Many people may not realize that there is a free add-in for the OneNote desktop (Office 2013 or 2016 and built in to Windows 10 and Mac) OneNote Class Notebook which is designed for teachers. The add-in "includes page and section distribution, quick review of student work, and assignment and grading integration with many LMS/SIS partners."